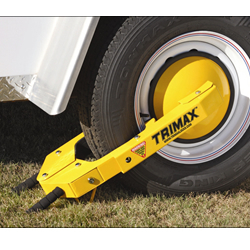 TWL100 TRIMAX Adjustable Wheel Lock. Fits Nearly All 10" - 18" Wheels. Easy Installation - includes all tools needed. Complete Instructions included. Heavy Gauge Steel Disk - covers lug nuts to prevent tire removal. Clamps tight to wheel for added security. Rugged weather proof epoxy. Powder coat finish prevents rust.